Drain and rinse beans in a colander. Let sit a couple of minutes to drain well. Place beans, lemon juice, salt, pepper flakes, and garlic in food processor. Start processor and drizzle in oil while processing. You may need to stop and scrape down the sides several times. Add more oil if needed for desired consistency. 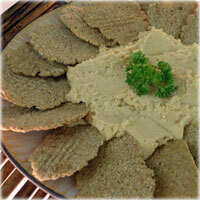 Use smaller amount of red pepper flakes for more mild hummus, and larger amount for more heated hummus. Variation: For Spicy Curry Hummus add 1 tsp. curry powder.